A white paper is a persuasive document that provides useful information to help readers understand how to solve an issue. Marketers use white papers to provide an in-depth discussion on a specific topic. A white paper usually addresses topics such as: business issues or problems your customers face, best practices for addressing those challenges, industry trends, and benefits of adopting certain solutions. A white paper is a unique marketing tool because it can both educate and sell. Copywriting a white paper can help your business stamp your authority or expertise in a particular area. This may eventually influence and convince readers to buy your product or use your service. What is the purpose of writing a white paper? White papers act as a valuable source of information about a particular issue, problem or challenge facing your target customer. Well-crafted white papers condense useful knowledge, present well-researched findings, analyse statistical data and synthesise other relevant information into a well-organised format. The most important thing to remember is that white papers aim to educate (and not hard-sell). A white paper can also be opinion-based, giving you the chance to provide a fresh perspective on a particular topic. By providing your point of view, you can demonstrate your knowledge and insights about your industry and differentiate yourself from your competition. A white paper showcases your expertise and acts as a useful tool in positioning your company as a thought leader in the industry. By demonstrating your strategic thinking and foresight through white papers, you can position your company as the go-to resource for your customers’ most pressing problems. White papers are useful for lead generation, especially in the B2B space. Usually, when a white paper is posted on a website, customers will need to furnish their email address and fill in a form to download the white paper. This offers a great opportunity to capture leads. Those who actively seek out information tend to be serious buyers and as such, are usually in the later stages of the buying cycle. What are the advantages of writing a white paper? White papers establish your authority on issues pertinent to your industry. They can contribute to debates, educate your prospects and boost your credibility in the market. By providing compelling content and useful solutions on issues that your prospects care about, your sales force can use the white paper to drive conversations and move your prospects through the sales funnel. Use this opportunity to work with your internal or external social media, digital marketing or marketing communication teams to cross-promote the white paper and related content across various channels. How do you write a white paper? Headline and subtitle: Offer an explanation of how your white paper will benefit the reader (instead of focusing on just you). Executive summary: Think of this as a condensed form of the white paper that boils down the main findings of the white paper and shares interesting highlights. Introduction: This sets out what the readers can expect in the white paper. It should draw them in by explaining why they should care about the problem and solution. Main content: The body of your white paper defines the core problem and outlines the steps that can be taken to solve that problem. You can split the main content into various sections with their own sub-headings. Side bars, pull-quotes, call-out boxes and graphics: Use these throughout the document to break up the text and draw attention to a key fact, list main research findings or highlight a an interesting opinion by a relevant source. Conclusion: This should demonstrate the significance of your main argument and summarise the key takeaways. You can also include a call-to-action in this section. Why hire a white paper copywriter? From translating your perspectives into easy-to-understand language to getting the right tone of voice, writing a white paper can be a challenge for you. 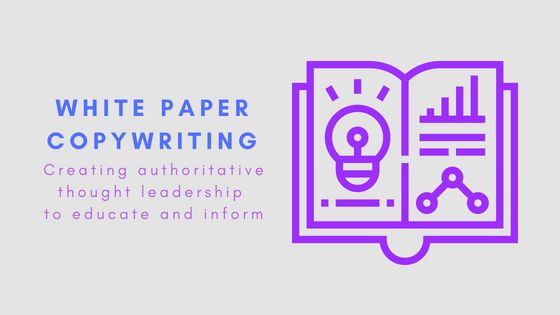 If you do not have the expertise nor time to craft a white paper, why not work with a white paper copywriter to develop your thought leadership content? A copywriter will be able to grasp key issues, convey complex information clearly, articulate your views and structure the content into one coherent piece that will make an impact with targeted decision makers in the buying cycle. Alternatively, if you have already initiated a rough draft of your white paper, you can also turn to a professional freelance copywriter to rewrite, edit or polish your content. Need to generate more leads with your white paper? Get in touch with us now to discuss how to write an authoritative white paper.